Silvert’s manufactures specialty clothing and footwear targeted at customers with disabilities as well as seniors. Their adaptive lines of clothing and footwear have become very popular in the past few years. Products are designed with specific problems, conditions, and symptoms in mind. While other brands may have shoes that are good for seniors, Silvert’s are designed specifically for them and it really shows. They may sacrifice a bit of style along the way, but they replace it with comfort, stability, and medical design features. This is a case where the name really says it all. These sandals are designed with comfort in mind. What might seem like an extra feature for some sandals is the sole focus of these indoor/outdoor sandals. The majority of the sandal is designed with a very comfortable and breathable fabric. The super soft cushioned insole will keep you comfortable while walking or relaxing. Silvert’s understands that seniors and people with disabilities can have a hard time finding a sandal that fits perfectly. For example, if the foot begins to swell, then a pair of shoes that fit yesterday may no longer fit. The adjustable easy touch straps and closure allow this sandal to adjust to various foot widths with ease. Standard sandals often have adjustable straps, but they are made from tough materials that can cause pain when strapped over a swollen foot. The soft, cushion-like material of these straps prevents them from causing any pain. Silvert’s has designed a great shoe for a very specific niche. If you are a senior who lives in a home care facility or a nursing home and likes to enjoy a daily walk, then these are a great pair of walking sandals. And they are still great even if you plan to spend most of your time indoors. Just don’t wear them if you’re feeling adventurous and want to go hiking. 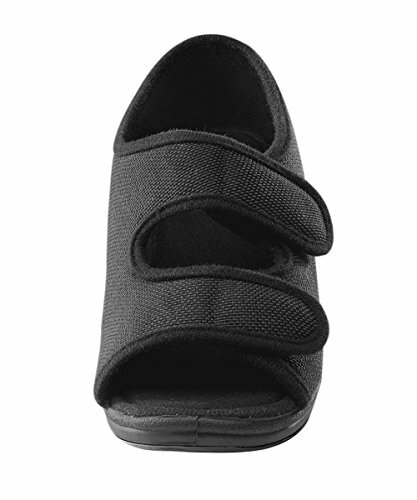 Foot length - 9 1/4", Foot circumference - accommodates up to 9 1/4"